As I set forth with this little dream of mine to share creativity with others I did not anticipate the number of hours of "work", as in not crafty, creative, fun stuff "work", that it would take to just keep going once the store became a reality. With that reality came the realization that I could not do it all by myself. I don't just want to sell stuff to people. That's not who it is that I am. If someone purchases something from me I want to provide them with as much knowledge, information and inspiration as possible. I felt that I was failing in that regard because I just didn't have enough time. I felt that I wasn't able to share enough projects with our customers; I just wasn't doing it all justice any longer. That is when we, Karen and I, made a decision that we needed help. Life just happens to happen. I have always admired Debbie Olson. The incredible precision with which she completes a project - her artistry and creativeness, these have always shone forth in my mind. Debbie and I became friends - she is a wonderful woman and I feel so lucky to now call her my friend. I believe we were brought together. 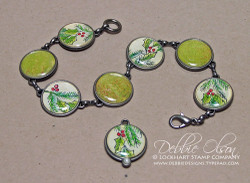 Debbie became the first to assist us by sharing her beautiful creations, using the Lockhart stamps, with the stamping world. Debbie, thank you for being such a pleasure to work with. Thank you for being my friend and colleague. You are sweetness personified. Your wit and charm are priceless! I loved spending time with you this summer. Debbie, with her husband Rick and son Benjamin, live in Norway, Michigan. After attending her first rubber stamping event in November 2000, Debbie was thoroughly hooked. Stamping provided the perfect creative outlet. Favorite things to stamp include nature, especially flowers, and vintage images, but Debbie also has a great appreciation for clean and graphic images as well. She adores embellishments--the more the merrier! Debbie was privileged to be in the very first Splitcoaststampers Dirty Dozen Team and has since served on several design teams, including Technique Junkies Turbo Team. Currently Debbie does freelance concept design and home schools her son. She enjoys blogging about stamping at www.debbiedesigns.typepad.com. Michelle Wooderson, or perhaps better known as Mish is also a dear friend that I have known for a number of years. We met at a Stampin' Up! convention several years back after having gotten to know each other on Splitcoaststampers back in the very beginning of SCS. I have always enjoyed Mish's wonderful attitude towards life. When I learned that she was looking to expand her business I knew that she was someone I could always count on, laugh with and look to the positive in life. She makes me want to come and sit on her front porch amidst the beauty and sip lemonade with her! After that we could go down into her craft space and giggle for hours as we busy ourselves stamping. I know she would come up with some funky wonderful fold, or pocket, or... Someday Mish I am going to show up on your doorstep you know! Be prepared – Mish has completed her first kit and it is a KNOCKOUT. I hope to get everything completed and get it up on our site ASAP. Watch for an announcement soon! Now I arrive at the next adventure in our tale. We are so thrilled that both Cindy Lyles and Sharon Harnist said “Yes” when we invited them to work together with us to share their talents and ideas with others using the Lockhart Stamp Company images!!! Who are these new girls? Cindy Lyles - altered artist extraordinarie. Cindy has been a fan of the Lockhart images for some time. I know this because she has quite the collection already. The things she has made have always enchanted me. She works with jewelry, Ranger products, 7 Gypsies and... I am SO excited to see what it is that Cindy is going to create with the Lockhart stamps. I have known Cindy for some time as well and have been so lucky as to spend time with her on two occasions - first at a Stampin' Up! convention and then at a wonderful retreat with some dear friends. She is a FABULOUS teacher. I must tell you that she does EVERYTHING fast! Man, does this girl move - she accomplishes so much in such a small time frame!!! Cindy is the owner of a fabulous on-line E-bay store called Starlitstudio. I would like to invite you to visit her store. The customer service she provides is five-star! She carries a wonderful assortment of altered art embellishments and a host of other wonderful goodies! I have learned SO much from Cindy - her willingness to share information with me when I first started - I can not thank her enough. I’ve been playing with paper all my life, and creativity was expected and encouraged in the home I grew up in. In continuing the tradition, creativity is encouraged in my home with my children as well. From a creative childhood, to working for international collectible companies in the product development arena, creativity has always been a major force in my life. In 1999, the local need for unique invitations, thank you notes and so forth, designed and delivered became the cornerstone of my business, called “StarLitStudio”. I create mostly at night, when the house is quiet and the stars sparkle brilliantly in the night sky. This business developed into not only custom invitations and design work, but an online store, providing embellishments and ephemera for the do-it-yourself crafter, specializing in the 7gypsies product line. I am ever so thankful that what I do for a living is what I so enjoy. Visit Cindy's Blog at: www.starlitstudio.blogspot.com and her store at StarLitStudio. And finally we have sweet Sharon Harnist. That southern accent will just get you every time. The lilt in her voice just makes me grin. I “met” Sharon when we worked together on the Thomas Kinkade team. Again she is someone whose work I have always admired. The books, altered items, scrapbook pages and cards she has made are all exquisite. We were actually on the phone today because I just was jumping up and down in my chair when she shared a project she was working on. She is yet another wonderfully talented individual that blows my socks off! Sharon is a native of Texas and has been involved in many different types of crafts all her life. 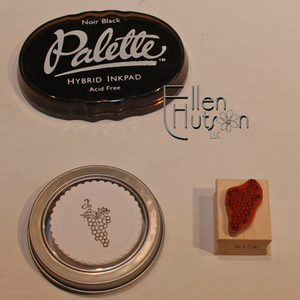 She started scrapbooking in 1996 and was first introduced to rubber stamping in February 2004. 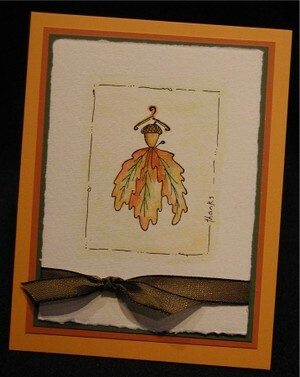 Shortly after, she became a demonstrator and instructor of rubber stamping, cardmaking & scrapbooking in May of 2004. Sharon's favorite papercrafting projects are coloring stamped images, altering 3D items, cardmaking and scrapbooking her two young daughters' photos. She has been married for almost 14 years and is currently a stay-at-home Mom, developing a career in the papercrafting industry. You can visit her blog at: www.paperfections.typepad.com. I would like to take this opportunity to thank these women for sharing their creative talents with the crafting world on behalf of Karen and myself. We look forward to the year ahead and to sharing many fun new ideas with you all. To close I would like to extend my most heartfelt thanks to all of YOU! I could not have this business without you! I would not be able to work together with those I value without you! Thank you for being here, thank you for supporting us with your hard earned dollars. Please know that we will always do our best to continue to provide you with as much creative inspiration as possible. You make this possible for us - we thank you! Well this crazy old computer - LOL! It has really messed up my post. Or perhaps it's the fact that I'm REALLY, REALLY tired and it is a human error - Ü. I think I will leave it as is for tonight and will attempt fixing it in the morning :D Sorry for the weird spacing and misplaced pictures! The women who work with me are so incredibly special. I hope that they know how much they mean to me and how much I value them. Their friendship, support, encouragement and incredible talent never cease to amaze me. This post has been far to long in the making. I kid you not that I have taken numerous photos in my attempt at getting here. Finally I have arrived. It has been a year since this adventure began - it all started as I worked with Karen. The first person I would like to thank tonight is Karen - her encouragement and support have meant the world to me. Karen moved from California when her hubby Scott started a job here in the Northwest. I feel so lucky to have her within 20 minutes of my home. We talk on the phone almost daily. Each conversation is filled with laughter. When we get together to share ideas and create I can almost feel the electricity in the air - it is so incredibly stimulating to work together as a team. Then there is Nicholas! What a darling little boy - he is definitely the apple of grammy's eye. Guess who gets to go on the Polar Express with Big Daddy and Grammy this weekend? I love hearing Nicholas stories - they make me laugh! There is so much more that I could tell you about Karen, but being I have numerous other bio's to include I will stop for now. We didn't get a chance to take a "headshot" of Karen to include in this post and so I will just have you visualize a beautiful, smiley face. Karen I appreciate you! and you are NOT off the hook for writing a little something about yourself SOON! These three women are my lifeline - I kid you not! Beth began helping me once the kids were in school this fall. She is my CFO Ü She works daily helping with the bookkeeping and customer service. Her quick wit and fun sense of humor make me happy to have her here! Malin, my dear friend who watches out for my kids, my dog and my well-being - Malin, who made me get tears in my eyes when I read the bio she wrote today. Malin and Malena help receive inventory, organize, organize and then organize again. They pack boxes, ship boxes, help me in whatever capacity I need. Malena came to my rescue this summer when Malin headed back to Sweden for the summer. She has continued to stand by my side since that time. They all nod when I ask them if it looks OK - LOL! When I ask for suggestions they are there to help me make decisions. All three are an absolute delight to have around and I thank them from the bottom of my heart for rescuing me on a continual basis from my overcommitments. I guess I should include our littlest of helpers here as well - I'm thinking you might get a grin out of this picture. Left to right: Buddy, Nino and Jasper - they are sitting atop a chair in our family room, looking out the window waiting for the kids to come home. Somehow they have this sense of time and they just know when to start watching for their opportunity to distribute lots of kisses and tail wags. 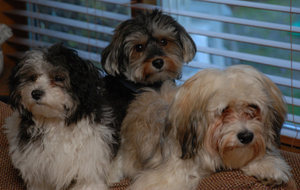 Yep, they are all Havanese. We joke with Beth that it is a requirement to work here - ha! ha! So perhaps sometime we will have four in this picture :D These three adorable little boys get in trouble constantly. They provide us with plenty of kisses (licks) and quite a diversion when we are supposed to be working, with their adorable antics. Buddy is the youngest and belongs to Malena, Nino is the oldest (it's his fault - I fell in love with him you know) and he belongs to Malin. Then there is my little Jasper - who looks enormous and scruffy right now being that he is in desparate need of a haircut. That is to happen this Saturday. He brings so much sunshine to our lives each day. I had no idea that my heart could be stolen by a puppy as it has been. Malin joined me in May of 2007. Hi, I'm Malin. I moved to Seattle from Dublin, Ireland 7 years ago with my family. We bought this gorgeous house (your first house is always fabulous) in this great community and the first people we met were Ellen and her family. It was a perfect match. She has two girls and so do I, plus we have our little Prince Charming. We have the same interests in Food, Photo, Skiing, Hiking and last but not least STAMPING. Our husbands with the same initials, J.J., enjoy the odd Pickle Ball and Poker game together. It's at least 5 years since Ellen and I were introduced to the magical world of Stamping. We took the same class and it was a lot of embossing powder at that time... anyway, we both loved it and got hooked a.k.a. had to buy it all. 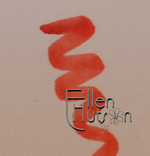 Ellen is a great Artist and when she became a Stampin' Up! Demonstrator she took it to a whole other level than any other I have seen. As time goes by the kids grow up, the girls are now in High School and Middle School, and Katrina and Max who used to be the cutest little couple together, are now on opposite sides of the fence. 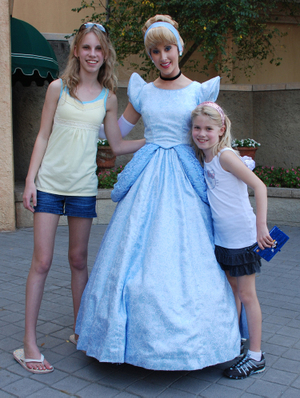 One is a mature well-spoken girl and the other one is an energetic, sporty and very afraid of girl-germs boy... oh well, I guess we just have to wait a few more years until Prince Charming is back in town. Ellen started her business a year ago when she had more time for personal development as Katrina was in school fulltime. The Business took off like a rocket and she asked me if I was interested in helping her out a few hours, until it had settled down. Well girls I can only tell you this... it's not slowing down and I love every minute of the day working for Ellen and with Malena and Beth. It is a great privilege to be able to enjoy your work, have your friends as your colleagues, walk home for lunch, bring your dog to work, and have the kids play or do homework at your job while you finish up and see to it that every last order that can, is shipped out. I don't know what else to tell you. I'm Swedish too. We left Stockholm 11 years ago for a two year adventure in Dublin and see, here we are in the most Beautiful City... in at least the States... Seattle. We love the Mountains and the Ocean and everything in between. Where else would you ever want to live when you can go to Sweden for a summer vacation to see family and friends and then come home to sweet Seattle and your great job with Ellen. Insert teary Ellen eyes here - I THANK YOU Malin!! My name is Malena. I am 45 years old and have been married to Anders for 18 years. We have two kids. A boy, Daniel, who is 17 years old, and a girl, Ida, who is 15 years old. We moved here from Stockholm, Sweden a little more than 6 years ago. We all love it here, but of course we miss all our family. 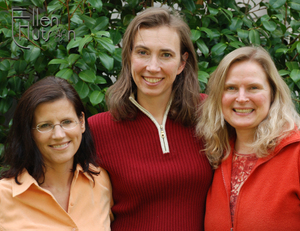 I started to work for/with Ellen in mid-June 2007 because my friend, Malin was going to Sweden for the whole summer. She already worked for Ellen and needed a substitute. I told her I will work for her... and Ellen thought it was a good idea... *smile*. So here I am... still working and having a really good time doing it. I really like crafts of all sorts even though I don't do very much right now. I also really like to bake cakes and cookies. I read books and love to watch a good movie. And of course, spend time with my family and friends. In Sweden I worked as a receptionist and switchboard operator. I studied marketing economics, but didn't get a chance to work with it since we moved here just after I graduated. When I am not busy with work, I am busy with our kids' activities; competitive cheerleading, acting/modeling and soccer. It takes up a lot of our time, but our kids really enjoy it, and we love to do things with our kids. Then we have the latest addition to our family... Buddy, our little Havanese puppy. Since Malin has one and Ellen just got one, we just had to cave in to our kids plea and buy one too. Well, this was a little bit about me. Now you know who to blame if there is something wrong with your order *giggle*. To end this... I really enjoy working here and to pack/ship your orders!!! My Dear Malena - you are a treasure - thank you for being here and being a part of this adventure! Beth, our latest "victim" (chortle) began in September 2007. I'm Beth. I relocated to Issaquah, Washington 8 years ago where I began my life as a stay at home suburban mom, complete with mini van and everything. I have 2 children, nine-year old Michael and six-year old Connor. We have gone from being dog people to cat people. After my black lab Sadie and my golden retriever Dusty died, we have an adopted cat named Lexi who has feline HIV. I get my dog fill from licky Jasper, pom pom Buddy and lap-lover Nino. That being said, I am an animal lover and all my pets have been from rescues. I grew up in the seacoast area of New Hampshire. I went to college at the University of New Hampshire. My family is still there so I get to visit yearly. While I am loving the Pacific Northwest, I am a bit homesick for the beaches of my home. I also lived in Denver, Colorado, Wash park area, for 12 years. I love Colorado. I miss the sunshine, city living, and of course the skiing. I am a skier, and may work weekends as a ski instructor at our local ski area, Snoqualmie this winter. As all moms are, I am striving for balance so I can pursue my passions, which are the environment (I am a green wip), teaching children (this will never end), and heal and fitness (another wip). My favorite TV shows are Dancing with the Stars and Greys Anatomy. My favorite drink is my first cup of coffee in the morning. My exercise of choice is rollerblading and swimming. Beth, I value so much how you treat each of our customers with kindness and how you can help bring a laugh to our days! OK - so this is a LOT longer than I thought it would be so I am going to break it up in to two parts :D I hope have enjoyed meeting the girls I work with every day - leave them a note if you are so inclined. It is fun to get feedback and I know that it wasn't an easy task for them to talk about themselves :D Thanks girls for all you do to help me each and every day!!! I know that many of you are anxiously awaiting the answer to this question and so I am going to try and give you as much information as possible so that you can make an educated decision about what is happening with our Copic Marker inventory and whether or not it is wise to purchase the current colors. When coordinating colors to the Stampin' Up! cardstock colors I worked for some time trying to get it as close as I possibly can to being a perfect match to the Stampin' Up! cardstock colors. As you well know dye lots vary and so I can not guarantee that the cardstock I have will be the same as your cardstock, but I did select colors that will be a fairly close match to the SU colors. As you can see below there are a few colors that I could not achieve a perfect match. To achieve what I have above there will need to be more than a simple set of 48 basic colors, 12 add on colors (In Colors) and 4 neutrals. 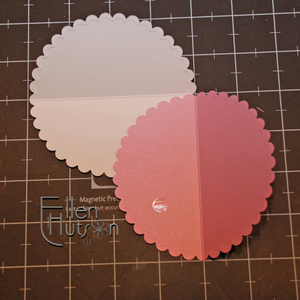 To create a coordinating color I went through the colors one by one - coloring them on Solar White cardstock. The white of the cardstock will also affect your color outcome. The white of the Solar White is a Bright White - subtle undertones in white will make your color vary. Below is an example of just one of the colors that I selected. Once I had finished with coloring I would place my sample directly on top of the cardstock - if it wasn't close I would try again. I have many, many, many little color squares - LOL! Maybe I should create a paper quilt :D Ya, like I have time - ha, ha. My first round of coloring was using a single color. After going through all my options I then went to round two. Combining two colors to make a perfect match. Well as you can see there were still some that aren't quite there and unfortunately I have not figured out a method for getting there, but they are SO close that I can't imagine anyone really feeling like they don't coordinate with the Stampin' Up! colors. Honestly I could not believe it when I took the Stampin' Up cardstock, ink and marker colors to study my comparisons and realized that WOW - the SU colors were many times very different from the cardstock color. Therefore I decided that I needed to coordinate the Copic markers with the cardstock only, being that it is the primary item to which you will be coordinating your coloring. seven new sets of 12 - four will coordinate with the 48 colors, one will coordinate with the new colors (the In Colors), one will be composed of all neutrals (I could not believe how many of SU's colors have gray in them - the Copic colors are so vibrant, many of them needed to be "toned" down) and last another set of 12 that you will need to bring the 60 colors in Stampin' Up's current line (and last year's In Colors) to the correct hue. These seven sets will have duplicates of our current colors in them and thus the addition of the two sets 24C and 24D. This will allow our current users to have no duplicates. Our colors will not use the Stampin' Up! names being that we do not want to infringe on Stampin' Up!s business. Alcohol ink markers are completely different and therefore we will keep our colors distinct from the SU color names. 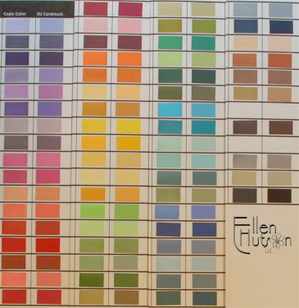 With each order that we send out I will include my "formula" for mixing the colors to arrive at a final color. After our latest update today from our supplier we are under the impression that these new colors will not be available until the end of December or perhaps even the new year. They didn't show up on the last boat. I must thank Kate, Ron, Marianne and Justin for hanging in there with us. They have no idea what to anticipate with their shipments from Japan either. It amazes me being that I like to have the bottom line on everything - but patience is fortunately one of the traits I try and practice on a daily basis - LOL! I apologize for not getting this information to you sooner. There just are not enough hours in the day is what I have determined. We did receive word today that our sets of 24B are finally on their way - woohoo! So we have put them up as a preorder knowing that what we have available will ship out this next week (not in several months like last time! ), but once this shipment is sold out they will disappear from our site yet again. I can promise you that we will do our best to meet your needs, answer your questions and be here for you when you order from us. So I'm guessing I'll see you at midnight being that there are a few things that my computer just wouldn't do for me and therefore I will be behind the scenes putting the numbers in place to get the new Lockhart Stamp images live. Remember you can put your items in your cart, but you must check out after midnight to get the code to give you the 15% discount. Remember CELEBRATE. Thank you all so much for your incredible support!!! Sorry about the Copic post going live - I save my posts as I work on them in case my computer goes wonky and well... I wasn't even close to finished yet. Watch for more to come this afternoon or evening. I still have a lot of work to do on that post - LOL! It's funny how when I think those words I start humming the tune, but this has nothing to do with Huey Lewis' song "Hip to be Square". It has to do with "Inchies". I have learned that "Inchies" are hip right now, or they are becoming "hip" - so it IS "hip to be square." Karen asked me one day, "Have you heard of Inchies?" I was totally confused - was she talking like inches in a foot, or inch worms, or... I replied - "ummm, no - I don't think so." So then she explained and my mind just went bouncy with ideas. Inchies - what are they? Well they are just that, little 1"x1" squares. Create them...trade them...collect them. They are a smaller version of ATC's I guess you might say. The fun thing is to see what can be done with such a little, teenie, tiny canvas. There is something about items that are gigantic or itty bitty - they seem to really grab your attention. 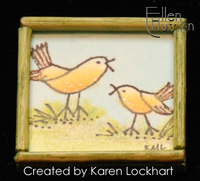 So Karen started creating "Inchies" and yep, they grabbed my attention. The picture you are viewing is huge compared to this little Inchie - but I thought I would share one of the many fabulous Inchies tonight that Karen has created. Over the next weeks and months we hope to share a lot more and have fun playing with these Itty Bitty canvases. These birds are from the new Lockhart images being released this Friday. They are the Itty Bitty Birds not the mongo sized ones that appear here - LOL! 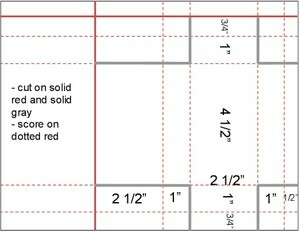 begin with a 1" x 1" square (typically chipboard). You can use cardstock, fabric and I've even seen glass, metal and plastic. The only rule is that the surface needs to be 1"x1". I like chipboard being the depth of the chipboard makes these fun to hold in your hand and stablizes them making them a little more substantial. decorate your square using anything you like - you can stamp it, collage it, doodle or draw it, add words, texture, frames, epoxy tiles, decorative papers, old book pages, definitions, Diamond glaze or Crystal Effects, glitter, liquid applique, teeny tiny bellies such as pearls, tiny brads, buttons, pin heads, fibers - the list is endless - if you think of something cool - try it. put your initials someplace on the front of the inchie. optional: add a magnet to the back. Magnetic tape works great and if you want that powerful snap there are many awesome magnets on the market now, but please keep those away from small children. These little canvases are so bright, colorful and appealing to little hands and mouths alike. 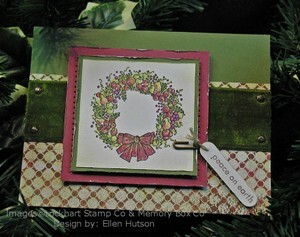 leave suggestions in the comments box if you have other fun ideas that you would like to share with the stamping world. start a little journal. When you receive an inchie immediately put a little number on the back and add it to your journal book. Use this number to remember who your inchie is from and when it was that you received it. If you are anything like me this is essential - I can't believe how easily I forget these days. EVERYTHING has to be written down - LOL! if you are shabby choose a "shabby" old surface, if you are contemporary - keep it slick and clean. Get creative as to how you would like to view/display your inchies. The first "How-To Inchie" I will present to you tonight is a very special inchie that was created by Karen. I thank her from the bottom of my heart for "rescueing" me today. I knew I was in trouble last night when I just ached from head to toe from the coughing. After a quick visit to the doctor's office this morning it was confirmed - yep, bronchitis. So needless to say my creativity is more than zapped. Karen drove these over to me today so that I could take pictures of them and share them with you being that I just didn't have it in me to make anything inchie worthy today. Just a brief synopsis of how Karen put this together. She began with the smooth white surface and drew the little trees in using the Copic Multiliner .03. This is the pen that she creates all of her rubber stamps with and thus the scale works beautifully with her images. Step two - shows the initial layer of color - this was added using Copic markers. Step three - more color is added using Prismacolor color pencils. This brings out the texture in the paper. Step four - Nicholas is added on a pop dot. Step five - bling it up baby - the remaining surface is covered in an ultrafine mix of glitters that just make it shimmer and shine. Now this is the part where it gets awesome! Karen has made 30 of these for us to give away to the first 30 individuals who place an order for $30 or more of Lockhart Stamp Company images after they are released at Midnight on Thursday night/Friday morning. We are calling it our 30 for $30 giveaway. Unfortunately there is no way for us to let you know whether or not you will be the recipient of one of these goodies until your box arrives on your doorstep. I wish I could figure out a way to do this so that you would know immediately, but my mind is completely braindead at this point. Surprises are always fun though - right?!? So place your order for at least $30 worth of Lockhart Stamps as soon as possible Thursday midnight/Friday morning after the new stamps appear on our website and if you are one of the first thirty then one of these special little treats will be yours. I am also working on a post that will share a little more about who we are - yes, a little more about Karen Lockhart, the women behind the scenes (Beth, Malin and Malena) who help me right here each and every day, the incredible team of women who are our current business associates (Debbie, Michelle and Trudee), and then top it off by sharing our excitement as we announce two new colleagues that are going to assist us in sharing how to use the Lockhart Stamp Company images in innovative ways. So stay tuned for more exciting things to come! Mark your calendars for this Friday, November 30 starting at 12:01 a.m. - you can visit our home page for more details about our upcoming Anniversary Sale. Before I begin I want to answer the question many of you have asked - why are there duplicate standard circles in the Complete Classic Circle and Complete Petite Circle sets? Well the answer to that is - the standard circle works with both sets. Some people prefer the Classic Scallop for the larger scallop - there are 22 bumps around the circumference. Others prefer the Petite Scallop which has 37 bumps and therefore a more delicate look. Being it is a better price to purchase all four dies that coordinate together we did not want to have either selection feel short changed if only purchasing one set. Now if you decide that you need both the Classic Scallops AND the Petite Scallops then please do not duplicate ordering Complete sets for both. Only order one complete set and then the Large and Small Scallops from the other set separately. You will note that in the Gotta Have It All it includes only one of the Standard Circle Large and Small dies. We tried to think of the best way to package these and this is what we were able to come up with. Hopefully this makes sense - again we did this in hopes of making certain that we gave you the best value available when purchasing either set. Sometimes I amaze myself. As I was thinking about what I would do with the new Baby Bib that Karen designed it dawned on me that a petal card would be really sweet, and then, hey, why not use the Nestability Petite Scalloped Circle to make it?!? Woohoo - I can't believe how a brain works - I don't know where it came from, but I'm thrilled it came. View - Front side closed. I thought about hanging a tag from the center, but... What do you think? View - Back side closed. Do you like that twisty feel with the Dew Drop in the center? View - Inside of announcement. The wonderful thing about Memory Box cardstock is that it is double-sided. One side is white and the other has the most rich, beautiful color - therefore it was easy to make this candy-cane twisty color scheme (for this card I used Sugar Plum and Cotton Candy). 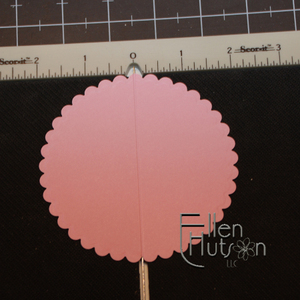 The first step is to cut and emboss four scalloped circles. 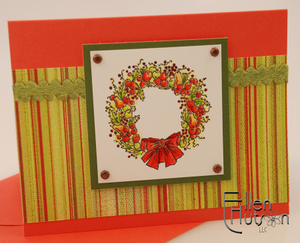 In this case I used the largest petite scalloped circle die. In order for the candy-cane swirl to occur I embossed two with the color face down and two with the color face up. You will see why in just a moment. Next you need to score your circles as shown below. I used my new desktop size Mini Scor-It for this project. I must say that it is coming in handy to have this little scoring board right on my table - I don't even have to stand-up anymore - LOL! It is more transportable than the large one and still makes the same wonderful score line. The price point is also much easier for crafters to budget for (OK, budget - I guess that's a joke :D). If you already have a large Scor-It board there really is no need for a small one, unless you go out and about a lot or want it right on your work surface as you are making your card projects. I will still use my large board for many purposes, but this one has it's advantages at times. 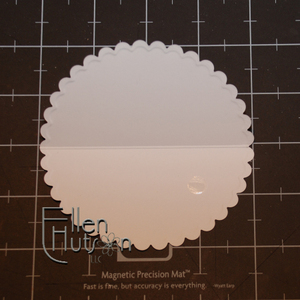 Using the Magnetic Precision Mat made it so easy to center the scallops and align the circles. 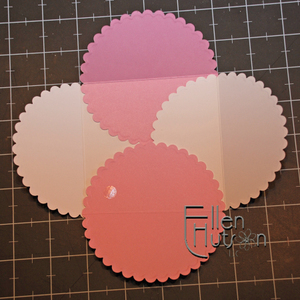 Attach a glue dot to the lower right hand corner and then lay down your next circle. Note how the circles are aligning, forming a square on the score lines. Add another glue dot as shown. These glue dots keep your work from shifting on you, yet they still allow for some movement to square up your project. I turned my circles as I was working because I am SO right-handed. This picture shows how I am alternating colors. The embossing is face down - it really adds a funky twist to the completed project. This next step can be a little tricky. Note the corner with the glue dot - you now need to tuck that corner in UNDER the white circle to complete your pin wheel look. 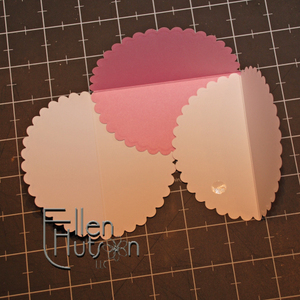 Square everything up and then press down on the glue dots to hold your circles in place. To complete the project I cut a square nestability out of the Cotton Candy stamping the latest Lockhart Baby Bib image (these will be available come Friday - be certain to stop by our store for our Anniversary Sale!). Adhere this piece firmly in place - this will keep those circles from slipping. 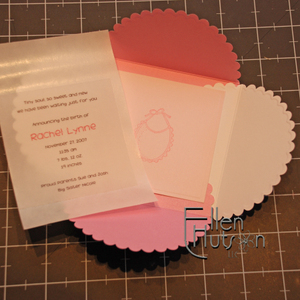 The announcement is printed on Vellum Cardstock using 2 Peas Heart's Delight font. My favorite way to adhere vellum to a project is by running it through the Xyron. NO adhesive shows through whatsoever! I love how the bib peaks through from behind the vellum. Again I thought about adding a little color to the bib, but went with simplicity instead. Last but not least was the addition of the little "flower brads". I made these by using a couple of tiny Making Memories button brads, glue dots, Prima flowers, more glue dots and then Dew Drops. The pink Dew Drops are in the Island Blossom collection. It is so fun to see these catching on and to see what you are all doing with them. Post a comment in the area below and link back to your creations if you have the time. It would be fun to share what you have done with these little finds! Finally a simple white shimmery cord was then wrapped circle eight style around the brads to close this little announcement. This same technique would also make awesome wedding announcements. I hope that you enjoy this little spontaneous creation and the use of the scallops to create a petal card :D See you tomorrow! 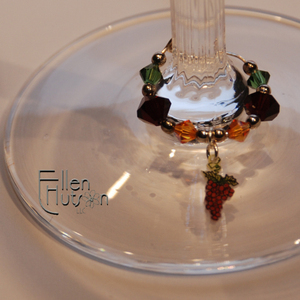 Remember when wine glass charms became all the rage. Well there is still something about them that I adore. Perhaps it's the small, cuteness factor, or perhaps it's actually the functionality of them. 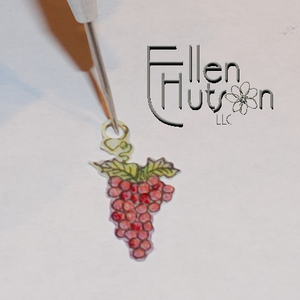 In thinking about projects for the upcoming Lockhart stamp release I knew that I had to use these Itty Bitty Grapes to make one wee charm. Then the question was what to package them in. I have had these tins sitting on my shelves for some time now and have never gotten around to using them, so I figured there is no time like the "present" - LOL! Man does my head do strange things to my writing skills when stuffed to the gills - I am just so not funny - ha! ha! I began by stamping on the lid of the round magnetic container. Yep, you heard me correctly - this little container has a magnetic backing and comes with a little divider in it that I just pulled out for today's project. You can store bellies in it, or whatever. I thought wouldn't it be perfect to keep your charms within arms reach attached to your fridge door?!? I began by placing a lid topped with paper under the clear surface of the container lid to support the acetate window. I then inked my stamp with Palette Noir ink. I love how Palette ink will stick to most anything - glass, plastic, wood, you name it. I then picked the lid up and colored the image from the back side using Copic markers. By coloring on the back side it doesn't mess with the ink of the stamped image. Tricky, nicky :D To color this image I used colors R27, R89, YG03, G85 and G99 (in these colors are hints of good things yet to come - don't go looking for all the colors we girls have been using just yet, but they will be here soon. Did you hear that Copic? :D) When coloring on acetate, glass, acrylics or any other see-through material you will find that the darker colors work much better. Experiment and see what it is that appeals to you. Then I blinged the tin by adding oodles of Fresh Grass and Hydrangea Dew Drops. Inside I punched a piece of glittery felt and attached to the bottom of the container. One can not have a charm container without charms, so I proceeded to pull out an old favorite. With Lucky Squirrel shrink plastic you need to sand it in opposite directions and preferably on both sides. If you only sand one side then it may curl back on itself and stick. For these little projects I just use scraps that I have dropped back in my shrink plastic folder - quick and easy! 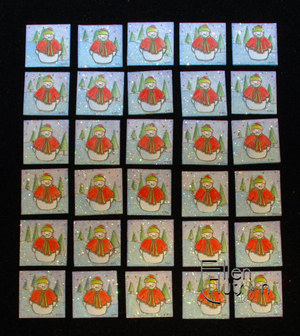 Once again I stamped on translucent shrink plastic using Palette Noir ink. I did it twice because I wanted to experiment with Copic markers as well as use my old stand-by, Prismacolor Color Pencils. This is the part that I find REALLY confusing - I thought for certain I would have a muddied ink mess when I used the Copics to color in the grapes. As you can see for yourself they are just fine. It could be that I heat set the ink after stamping on the shrink plastic from afar so as to not "shrink the plastic", or perhaps it could be that I did stay within the lines for the most part. I did get daring on the leaves and curly-q though and they seem to be just fine. I have not been able to take a decent picture of these charms now that they have been shrunk. The big difference in appearance is that the Copic charm has a glossy sheen to it, whereas the Prismacolor one is matte. I was tickled with this concept being that now you have a choice, depending on the look you prefer. After you finish coloring use a 1/8" Fiskars hand punch to punch a circle up by the curly-q. Then cut out your charm as shown below. The addition of this circle allows you to easily attach a jump ring to your completed charm. As I heat the plastic I use my paper piercer to hold it in place. Otherwise I end up on my knees under my table looking for my long lost itty bitty beauty. Pictured is the matte charm - it was just a little easier to capture in a photograph. Now on to some fun! I noticed today that all of a sudden my views jumped way up and thought to myself, I'm thinking that some blog candy might just be what they are looking for Ü... So I would love for you to post one thing about this year that has been special in your life, oh yeah - you can tell me how fabulous my project is as well - LOL! On Friday, November 30th I will then use the Random Number Generator to select a winner. So would you like to know what you can receive? The winner of this post will receive these. Yes, that's right - I "heart" you all! P.S. The Nestabilities have arrived :D :D :D - here's to hoping that we have enough to last through the weekend! Here we go Ü Tonight begins the countdown to our One Year Anniversary sale. So with that I would like to share that for three days, November 30th through December 2nd, we will have a storewide sale of 15% off everything in the store. This time round the sale will be first come, first serve. If we run out of an item we will not be putting it up for preorder. There are two reasons for this. First is because I know how disappointed you would all be if you do not receive that special item in time for the holiday season and unfortunately I think we will probably run out of some items. I just have no idea when those products will become available again. I have tried so hard to be certain that we are well supplied, but it seems almost impossible to predict. We have our Nestabilities arriving this week, but unfortunately what we have arriving is what we will have until sometime towards the-end of December. Spellbinders has more on order, but unfortunately they will more than likely not be here in time for the holiday season. Then there is Copic - we are still waiting, patiently (and sometimes not so patiently - LOL) waiting for the new Stampin' Up! coordinating color sets, as well as the glitter pens and current colors. If by some miracle they arrive we will put them up, but I'm not crossing my fingers at this point. There is just no telling when the Copic products will arrive and if they will arrive. I try so hard to "know" and yet there just are no good answers. The second reason for not doing preorders is because it was a true nightmare for us on this end the last time round Ü Trying to stay on top of the preorders during the last sale was a true test of perserverance and organization. At times I really wondered if I would loose my sanity - LOL! I thank you in advance for your understanding and I hope that I was able to make a fairly good estimate as to what we need in our warehouse and that we won't run out of anything. So now for the fun stuff! Tonight's project wasn't the one I was going to start with, but this cold that set in on Thanksgiving has really hit hard. I just couldn't help myself being that I believe I have used an entire box of tissues already and so tonight I present one of the images and sayings that Karen has added to her line this season. Being that cold season is upon us the timing of these images could not be more perfect - ha! ha! The little tissue box comes with the tissues drawn in place, but I just slit the top and inserted some real tissues for "effect". I then added the sentiment - it just cracks me up! As you can see I have highlighted my personal predicaments with Twinkle Stickers - I am both sneezie AND wheezie - thank goodness I'm not queezie - LOL! To kick off the countdown I thought I would share how I create boxes for "custom" sized products, in this case the cute little tissues. I begin by measuring the item I want to enclose - the tissues were 2 1/4" wide x 4 1/4" long x 7/8" high. Next I take an 8 1/2" x 11" piece of cardstock and start scoring. Perhaps I am rather odd in that I don't figure this all out on paper first, but I just visualize how it is that the item will fit inside the box and begin. I have posted the picture below so that you can see how easy it is to create your score lines in the correct position if you use the centering ruler on the Scor-It board. I have added little black lines to the score lines so that they show up a little better. The diagram below will hopefully help make this a little easier to understand as well. I begin on the right side of the paper and score my lines moving from right to left. 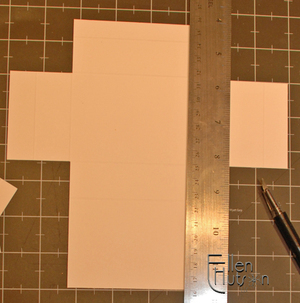 The first 1/2" is what you will always need to use to have a surface to adhere your box shape together. Next comes the height of the object you are making the container for. 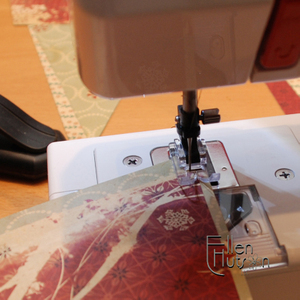 I always make it slightly bigger than the starting size - for example my tissues were 7/8" so I rounded up to 1". By aligning my first score line with the 1" mark on the Scor-It board you will be in just the right spot - score your line. The next measurement is the width of the object - the tissues were 2 1/4", again I rounded up this time to 2 1/2". Move your paper over so the score line now lines up with the 2 1/2" mark and score again. Repeat the height and width one more time and you have completely surrounded your object. Cut off the remaining paper along the final score line. Next you need to make the height work. For the flaps I decided on 3/4" to tuck in on the ends. So I began with the 3/4" tuck-in, then added the 1" for the height of the tissues. Then comes the length of the item. In this case the tissues were 4 1/4" and so I rounded up to 4 1/2". 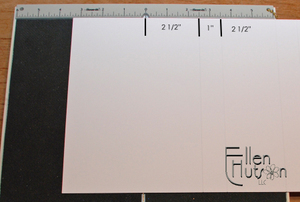 Another 1" for the tissue height and another 3/4" flap and you have the correct amount of paper for your project. The measurements need to be slightly larger than the actual product size so that it is not difficult to fit your gift in to the box upon completion. Next I cut off the excess paper. Using my magnetic placement mat, metal edged ruler and retractable blade cutting knife I remove the "corners" leaving only the body and flaps. One tip I have is to cut just inside of the score line, rather than in the center of the score line. This will help your box fit together better. I used a corner rounder to clip the flaps. Stamped and embossed the Millinery Ribbon, Rose then pierced on either side. I hope that this little project can be used by many of you to create gift boxes this holiday season and that not too many of them will enclose tissues Ü! I wanted to wish you all a wonderful and blessed Thanksgiving! Sorry it's a little late, but I was the chief cook again this year, thankfully my hubby was the bottle washer and the potato peeler and the go to guy for all the heavy lifting, my little one was the vegie washer and my older one was the floor washer and table setter Ü. There is so much for me to be grateful for this year! Even with all the little mishaps life threw our way we still have been so fortunate to not have lost any loved ones this year, to not have any major health scares and most of all to have the love and support of family, friends and all of you!!! This card was made some time ago, but I wanted to share it here again today - it is sort of representative of who I am - LOL! A little nutty (the acorn - ha, ha), sort of colorful, fluttering about in life like a leaf - tie it all together somewhat neatly in a fun way and hopefully it will bring a smile to other's faces. That's me - all I want to do is bring happiness to others and I hope that in a way this little blog and business that I run does that for others. Lastly top the card off with a thank you to each and every one of you who have hung in here with me over the past year! I know that I have not been posting nearly as frequently over the last two months and I apologize. I have been looking for ways to "repair" my body - thus I have been having to spend far too much time meeting with numerous specialists trying to figure out how we are going to proceed with my hip and foot. After numerous tests (and possibly a few more to come) it appears more and more like I may be in for yet another hip surgery. If you have any extra room for prayers and positive thoughts left in you I would appreciate you putting me in them in hopes that the doctors will make the right decisions. Finally what you have all been waiting for - I'm just going to commit to November 30, December 1 and December 2 for our One Year Anniversary Sale! Watch for more news over the next couple of weeks - I think that you will be excited about what we have in store. Now I'm off to just rest :D Hugs to all of you!!! I stamped the image on Arturo using Palette Noir. I then used Adirondack reinkers and my waterbrush to color in the image and create the soft washed background. Finally I used my Copic Multiliner to doodle the "frame" and add the word "thanks". Just a quick entry to let you know that yes, Spica Glitter Pen Pouches arrived today - alas they are missing the clear pen(insert big shocked eyeballs here - LOL). I have asked that they send the clear pens here via whatever vehicle that would reach us by Wednesday. I am so sorry for the delay. We will do our best to contact all those who have ordered to let you know the reason for the delay. Thank you again for your patience!!! Florida was WONDERFUL! The sunshine and warmth rejuvenated our bodies. To be in 70-80 degree weather is pure novelty - LOL! We had so much fun riding the rollercoasters, collecting signatures from the characters (Katrina in particular loved this part) and watching the fireworks parades and shows. We also enjoyed the wildlife at Sea World. Feeding the dolphins was a highlight for us! The sounds that they make when they know the fish are coming and the "smiles" that they give when popping their heads up for those tastey morsels - well it was awesome. I wanted to share two new kits with you that went up over the last couple of weeks. Items I haven't had a chance to talk about. 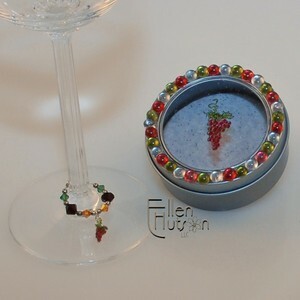 The first is a wonderful kit, Christmas Bracelet, that Debbie Olson put together with the Antique Silver bracelets. Once again Debbie has done an amazing job of selecting items for this kit. These will be ideal to wear during the upcoming holiday season! Then I finally received the last of the product in that was needed for the Sweet Treats Cornet. This particular Cornet really appeals to me because of the vibrant colors. I can totally see putting little treats in these, hanging them on the doorknobs of friends homes, ringing the doorbell and running. 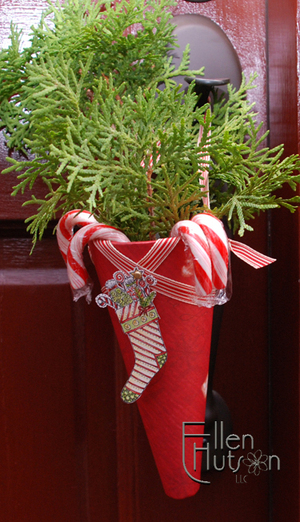 You could also hang them from the backs of guests chairs, on your tree or package them up with goodies to give to a friend. This photo also shows why I recommend the plastic as a template. 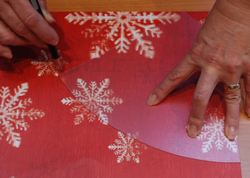 It is so easy to position your template when you can see through to the pattern below. I am still awaiting the arrival of a few more goodies for the one last cornet. Hopefully it will be soon being that the holiday season is rapidly approaching. I also have a few more surprises that I'm working on this weekend - I hope to get them done pronto being that I think that they will add a fun twist to your Christmas decorating and gift-giving this season. Copic - more glitter pens are finally on their way and are scheduled to be delivered on November 19th!!! UPS typically delivers late in the afternoon and so we will do our best to get those orders out to you pronto. We actually have the boxes ready to go and are just waiting for those pens to slip in, seal up and ship. We are so anxious to get these to you as soon as possible. 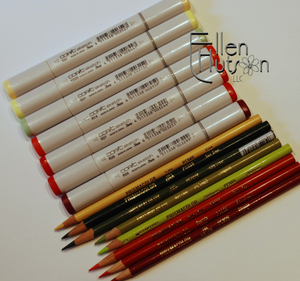 Copic SU Color Coordinated Sketch Markers - I would like to update you on the whereabouts of these. I have crossed my fingers and toes, and legs and ... well you get the picture - LOL!... that these will arrive the first part of December. I know that many of you have them on your Christmas wish list and so I am hoping that we get them SOON! Spellbinders - yes, we are awaiting our shipment just like everyone else. I have been pestering them for weeks now - LOL! They know that when we call we NEED an update. Well here is the update - they are to ship out our order on Monday or Tuesday of next week. With Thanksgiving in there I am guessing that they will not arrive until the following Monday - November 26th. I wish so badly that there were a way to pick up the pace. I sincerely apologize for this delay and wish that there were some way for me to snap my fingers and have the product appear, but unfortunately it doesn't work like that. I will keep you informed as to whether or not the shipment actually goes out and for those of you who have had the faith to preorder from us I can assure you that we have those boxes ready and are anxiously awaiting this shipment as well. Promptness and accuracy are so important to us and so it is incredibly difficult for us to sit here and wait - LOL! The last little tidbit I am going to slip into your ears is that we have a ONE YEAR ANNIVERSARY coming up Ü Ü Ü. I can't believe how quickly this year has zoomed by. With that anniversary will come a sale of course - LOL! I know you have all been anxiously awaiting word on this. I am still trying to nail down the dates. I don't want to have any preorders on our calendar being that it is such a nightmare to fulfill those orders when this happens and so I am trying to get everything lined up before announcing the dates. I was hoping to be ready for Black Friday or Cyber Monday, but alas the products just aren't here and I know how important it is to have as much as possible available to you for that sale. So please cross your fingers for us that we can get everything organized in the next week or so and announce those dates to you! When selecting what it was that I wanted to use for the Stamp of the Month project this month I decided to use the Autumn Wreath being that it would be appropriate for both fall and Christmas. Not only can you color this wreath in "autumn" colors, but it is easy to switch your color palette ever so slightly and turn it into a Della Robbia style wreath for the holiday season. I'm not certain if you will remember a card I did last year about this time in which I used a more traditional "holiday" oriented selection of colors. I thought I would share it with you again so that you can have yet another alternative to view while coloring your image. This month I wanted to share a more vibrant look. I love the new Memory Box paper collection, Studio. The colors are so vivid. Rather than going with the more traditional Holly Berry (which does look awesome with these papers) I wanted it to be a little more offbeat and selected the color Persimmon (I apologize for my inability to get the color correct on my computer screen - Persimmon looks just like the fruit - a fun pinky/orangey/red tone. How is that for a description? - LOL!) which we will be adding to our store soon. This allowed me to select vibrant colors for coloring in the image. This time I used a combination of Copic Marker and Prismacolor pencils. To begin coloring the image I used the lightest Copic colors. 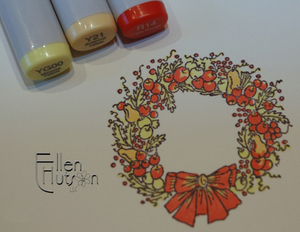 By quickly coloring the entire wreath I was able to define where my colors would be placed. During this application I work extremely fast - not worrying too much about precision. I then start layering the colors. Wouldn't you know it - the pictures I took of my coloring process were blurry - LOL! So I did a little "replication" below (this time I colored on white rather than the natural white) of only the bow section to share the step by step progression. I have often referred to using a plastic palette (at times I just grab the nearest acrylic block - at others I prefer to use something white so that it is easier to "see" the light tones) and so I wanted to share a picture with you being that a picture is worth a thousand words. In the tray above I colored R59 - one of the darkest reds currently in our color palette. I then used R14 to "pick" this color up off the palette with the tip of the marker. On the bow above I colored the lower portion of the bow using R14 dipped in R59. As you can see I start coloring up at the bow intersection where the "shadowing" would make your bow appear darker, dragging the color out to the end of the bow. As you color the marker color lightens back to it's original color. I then colored the top portion of the bow just using R59. I left the right side untouched and came back in on the left side with R14 to help "blend" the R59 out. 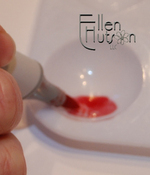 As you can see the color is much more "defined" at first from the color right next to it, when utilizing this method. There are many different ways to arrive at a "similar end". Picking the darker color up with the marker that you laid the first color down with, allows for the easiest of blending. Never fear that you will "contaminate" your lighter color with the darker color. Simply scribble your marker off on a piece of scratch paper - voila you will once again have a like-new marker with it's original color back again. Lastly I came back over top of the Copics with a variety of reds, and a Sand, Prismacolor color pencils. The texture and sheen that develop from this type of application are completely different then when using the Copic markers alone. Pictures can never seem to truly capture the variety of depth that is achieved using this method. You can see it best on the pears below, where the contrast is the greatest, how beautifully Prismacolor pencils "mingle" with Copic markers. This month's kit is finished off with the wonderful funky texture of the velvet rick rack, antique copper brads (don't be afraid to use these en masse being there are 100 in the package) and Dill cardstock. 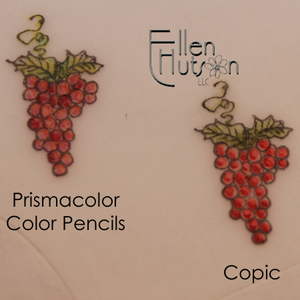 I will happily tell you that the order has been placed for the Copic markers that will match the Stampin' Up! colors, but I do not yet have any clue as to when those will actually arrive. It takes a while you know - LOL! So keep watching our blog and as soon as we having something more definitive I'll share the details with you. I have another bracelet kit that Debbie put together just waiting for me to get it up. It is absolutely "charming" (ha!ha! boy I am SO not funny when I'm tired) watch for it shortly. We are off to Disney World in two days!!! Our summer trip had been "postponed" due to my foot and so we are now on our way. Slow but steady - right?!? The girls - Beth, Malena and Malin, will all be here keeping things running smoothly and take caring of you and our pup, Jasper. I am so excited to be taking my littlest for her first real visit to see the mouse. We tease her that she has been there before, but she seems to think that being one just doesn't count - LOL! I hope to be back one more time before then, but as you can see by the few posts of the last few weeks life is spinning out of control. I can promise you that I have some wonderful things in store for you to celebrate our one year anniversary the end of this month (big wink!). Take care and have fun being creative!! !